Prog kings Marillion headlining the Palladium! Who would have thought it? Though as those who follow the band know, this was their second London showcase gig in a month following their sell-out appearance at the Royal Albert Hall. In fact, they sold out the Albert Hall in just four minutes, and the Palladium in just a few minutes longer. Quite astonishing! The evening opens with the personable and immensely likeable Harry Pane, whose brief set of heartfelt and accessible acoustic material suggests a singer/song-writer of real talent. Particularly impressive are the emotive 'Fletcher Bay' and a contemplative and yearning cover of Fleetwood Mac's 'Big Love'. One can't help feeling that if he gets a break or two, there's a lot more to come from Pane. It's hard during the interval not to sense the crowd's anticipation, nay, impatience, for the main attraction and Marillion duly burst into action with a powerful version of 'Slainte Mhath' to a Marquee backdrop. It sets the tone for a set-list that is radically changed from the Albert Hall performance as they mix old, very old, more recent and brand spanking new material to impressive effect and in a manner that recognises and celebrates their full history. Indeed, the band fair romp through a crowd-pleasing set that takes in 'The Uninvited Guest', 'Mad', 'Afraid of Sunlight', 'Real Tears For Sale' and 'Heart Of Lothian'. A particular highlight for me is the moving and engaging 'Beyond You'. Of the new tracks in the set (from the 'F.E.A.R.' album), 'Eldorado' is simply stunning with the whole band, and Steve Hogarth in particular, delivering an impassioned performance. Recent single 'Living In FEAR' is notable for its "yeah, yeah", crowd sing-along section, while 'The Leavers' ends on a high with the rousing "We Come Together" refrain and earns the band a standing ovation. While I've never quite been sure that 'The Leavers' has the legs for the live set, two and a half thousand other voices tell me I'm wrong, as a crowd that has been surprisingly restrained for much of the evening suddenly comes alive... and once they're up they don't come back down! Fan favourite, and arguably the best of the Hogarth-era long songs, 'This Strange Engine' is the first encore, superbly performed with Steve Rothery delivering "that" solo with consummate ease. Hogarth's autobiographical musings grow in poignancy with each passing year and it's a privilege to see it performed at this level of intensity. There's also a treat for the long-standing faithful with the "early days" coupling of 'Garden Party' and 'Market Square Heroes', the former inducing familiar spasmodic jerking throughout the audience as Ian Mosley steadfastly bashes out the track's quintessential prog rhythms and Mark Kelly launches into his rocked-up keyboard solo. 'Market Square Heroes' sounds gloriously edgy, ragged even, as Hogarth re-establishes his credentials as an anti-Christ for every occasion. Just when you think it's all over, the band hang on for a joyful if somewhat "truncated" version of 'Three Minute Boy', rushing to beat the six minutes left on the clock before the Palladium's curfew kicks in. Indeed, as Hogarth hits the final note on his keyboard, Steve Rothery has already taken off his guitar and is humorously checking his watch. 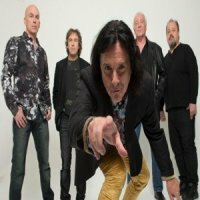 And then they are gone – another career box ticked, and another chapter written in Marillion's successful recent history. It was great to be part of it, or, as they say in these parts, it was nice to see them, to see them, nice.